Prince Garin is a brave, proud, adventure-seeking prince. Elani is his most trusted servant, and she would do anything for him - even die for him. Their quest to find the mystical Treasure of Isian is immediately interrupted, and they find themselves confronted by angry giants, soul-stealing elves, bewitched dragons, a vengeful water-witch, battling foes, and a mysterious kingdom. Elani must face her greatest fears to save her prince and her kingdom. Garin must decide what the most important things are in his life. Will they be able to make a great sacrifice to save the kingdom? And will Elani find true love? 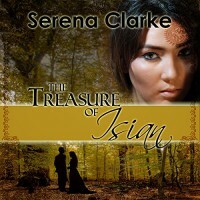 This is Book #1 of 3, so far, in the Isian series. The first two are currently available on audio. I really wasn't liking this book that much. If I hadn't received it for review, I probably would have skipped ahead to check out the end. But having done that, I would most likely have gone back and finished it after all. I liked the second half (or maybe the final third) much better. Nothing about this book is outstanding. I had issues with everything: the characters - Garin seemed contemptible, Elani a pathetic doormat, and everyone else irrelevant / the worldbuilding - elves who are really more like vampires?? / the plot - her situation, the quest, and the final revelations (which weren't even a tiny bit surprising) / and the writing style - especially the dialogue, which was clunky and contemporary (not historical) sounding. So why in the world did I give it a 3.5*? Because, in the end, "I liked it" which is my criteria for that rating. I liked the changes in their relationship and in the characters. Garin: He turns out to be not so bad, and then goes on to experience some excellent character growth. Elani & Garin: I think they will be able to find their equilibrium and be a very good couple. There were some very sweet moments between them. HIGHLIGHT: Garin handles her constant vomiting with aplomb (no she's not pregnant). The speed was good on this one. My usual 1.25 speed was a little fast for a first time listen. Some of her male voices weren't great, but they were acceptable. There were some fictional accents, I quite liked the Isian. What's your favorite YA romance between a common & and royal? How do you determine the rating for a book where you had mixed feelings?